A service is a user-defined set of caching rules and behavior for a website or application. The Fastly web interface allows you to create new services or edit existing ones and then activate new versions of them that include your changes once you have things configured the way you want. The web interface also allows you to do other things with existing services, like rename them, compare them to each other, deactivate or reactivate them, and delete them. Creating a service requires you to first create a domain and then a host. Click the Create service button. The empty state page appears. Click the Domains link. The Domains page appears. Click the Create domain button. The Create a domain page appears. Our guide to working with domains describes more about domains and what you can do with them. In the Domain Name field, type the name users will type in their browsers to access your site. Click the Create host button. The Create a host page appears. In the Name filed, type the name of your server (for example, My Origin Server). This name is displayed in the Fastly web interface. In the Address field, type the IP address (or hostname) for your origin server. Although we recommend setting up TLS when you set up a host, it's not required for your initial exploration and configuration testing. Leave the Enable TLS? default set to Yes if you want to enable TLS and secure the connection between Fastly and your origin. To enable TLS, a valid SSL certificate must be installed on your origin server and port 443 (or the specified port) must be open in the firewall. You can select No if you do not want to use TLS. Leave the Verify certificate? default set to Yes if you want to verify the authenticity of the TLS certificate. Selecting No means the certificate will not be verified. WARNING: Not verifying the certificate has serious security implications, including vulnerability to man-in-the-middle attack. Consider uploading a CA certificate instead of disabling certificate validation. In the Certificate hostname field, type your certificate hostname associated with your TLS certificate. This value is matched against the certificate common name (CN) or a subject alternate name (SAN) depending on the certificate you were issued. In the SNI hostname field, optionally specify your SNI hostname. This is generally only required when your origin is using shared hosting, such as Amazon S3, or when you use multiple certificates at your origin. See Setting the TLS hostname for more information. 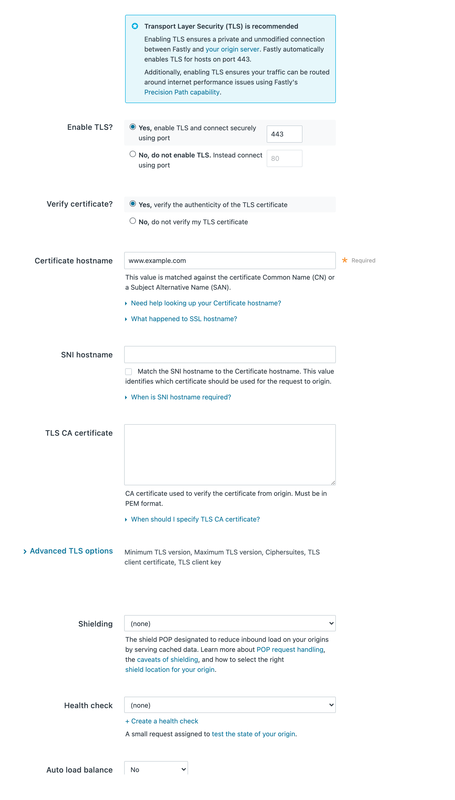 * In the TLS CA certificate field, optionally include your TLS CA certificate. You may want to provide the CA certificate if you're using a certificate that is either self-signed or signed by a Certificate Authority (CA) not commonly recognized by major browsers. See Specifying a TLS CA certificate for more information. Click the Create button. The new service appears in the list of services available. Click the Activate button at the top right of the screen. A confirmation window appears. Click the Confirm and Activate button to confirm you want to activate your new service. The Configure page appears displaying details about the configuration settings of the first version of your new service. As you experiment with service configurations, you can test their success before you start serving traffic through Fastly. Simply open http://www.example.com.global.prod.fastly.net in a new browser window, replacing www.example.com with your own website's domain name. Your website should appear, though it may take up to 60 seconds for new configuration settings to take effect. You can continue to explore various configuration settings for as long as you like, testing things repeatedly as you go. Once you’re ready, all you need to do to complete your service setup and start serving traffic through Fastly is set your domain's CNAME DNS record to point to Fastly. For more information, see the instructions in our Adding CNAME records guide. Fastly locks versions of services you've already activated to make rollbacks safer and provide version control. You can duplicate ("clone") any existing service version, active or inactive, and edit that cloned version. You must "activate" new versions of services in order to deploy their configurations. Configuration changes are never automatically activated. Log in to the Fastly web interface and click the Configure link. The Configure page appears. Click the Edit Configuration button. The Edit Configuration menu appears. Select Clone version [version number] (active) to clone the active version of the service for editing. Select Edit version [version number] (latest draft) to edit the latest draft of the service. The service version page appears, listing the version. Click Activate. The new version of the service is activated and appears in the event log. In addition to creating or editing services, you can view all your services, view a condensed list of your services, star them to pin them to the top of the All services page, rename them, compare versions of them, deactivate or reactivate specific versions of them, and delete them. To view all your services, log in to the Fastly web interface. The All services page appears displaying a summary of all your services, sorted by requests per second. If you have a lot of services, you can view a condensed list of all your services. On the All services page, click the icon with three lines above the list of services. If you have a lot of services, you can star the services you use most often to pin them to the top of the All services page. Click the star next to a service to pin it to the top of the page. Select the service name text box and type a new service name. Press enter. The newly renamed service name appears. Click the Diff versions link located under the Service ID. The Diff versions page appears. Removals are highlighted in red with a minus sign at the beginning of the line. Additions are highlighted in green with a plus sign at the beginning of the line. You can change the compared service versions by selecting a different version number in the selection menus. Click the Options button and select Deactivate. The deactivate service warning appears. Click the Confirm and deactivate button to confirm you want to deactivate your service and acknowledge that you no longer want to serve traffic with it. IMPORTANT: To minimize the risk of unauthorized use of your domains, we strongly recommend modifying or deleting any DNS CNAME records pointing to the Fastly hostname associated with the deactivated service. Follow the instructions on your DNS provider's website. You can also activate or deactivate a service via the API. Did you accidentally delete a service? We can help. Click Activate. The service is reactivated. If you removed the DNS CNAME records for the service's domains when you deactivated the service, you should add new DNS CNAME records now. 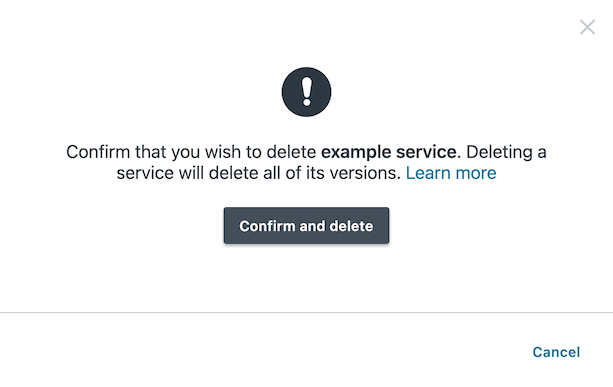 Fastly allows you to delete any service you create, along with all of its versions. Fastly does not offer a way to delete specific versions of a service, however. Service versions are meant to be an historic log of the changes that were made to a service. To undo changes introduced by a particular service version, you can always go back to a previous version and reactivate it or clone a new service version based on any old version. Click the Options button and select Deactivate. The deactivate service warning appears. Click the Options button again and select Delete. The confirm delete window appears. Click the Confirm and delete button to confirm that you want to delete the service. 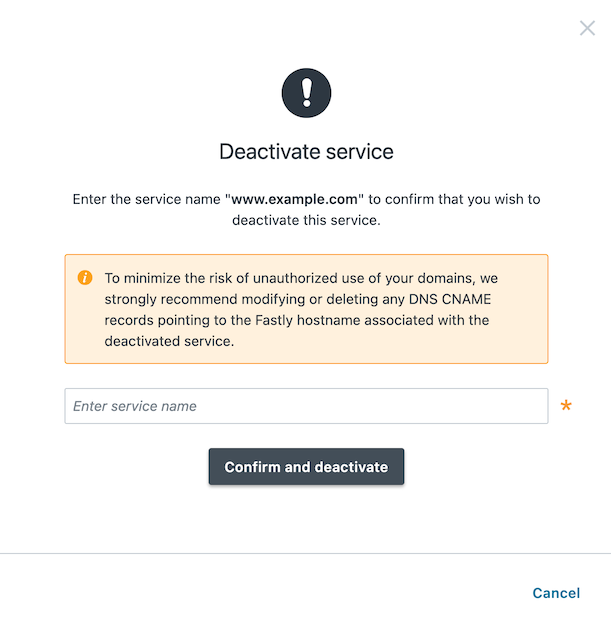 IMPORTANT: To minimize the risk of unauthorized use of your domains, we strongly recommend modifying or deleting any DNS CNAME records pointing to the Fastly hostname associated with the deleted service. Follow the instructions on your DNS provider's website. Service versions can include comments to label them or identify work in them. You can add and update version comments on both locked and activated service versions. Click the Add comment link on the upper, right side of the web interface. In the Comment field, type a meaningful comment for the version. Click Save. The truncated version of the comment appears where the Add comment link used to be. 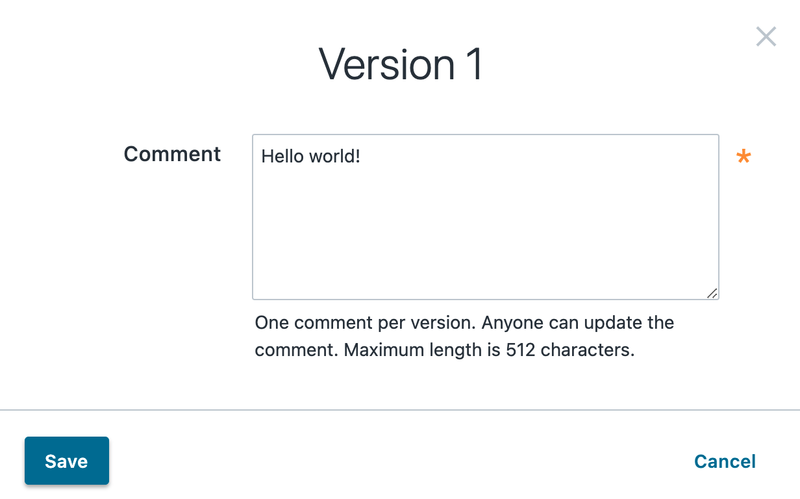 TIP: You can view service version comments at any time by clicking the service version number to display the version selection menu or by clicking the version comment icon to display the version comment in a separate window. Version comments also appear in the event log to help with account activity monitoring. Customer Support will notify you when your service has been restored.